mommygorjess: Disney Freaky Friday out NOW on DVD! Disney Freaky Friday out NOW on DVD! I am sure I am not the only 90s mom on here that has a thing for original movies being remade for our new generation. I love being able to watch with my boys a classic movie I watched at their age, and then being able to see the remake with them together. It shows them that things of the past still have value, and an impact on people no matter how much time has past after it. When I found out that Disney was making a remake for Freaky Friday, after15 years I was very excited. I instantly found the 2003 original and we watched it with the boys. 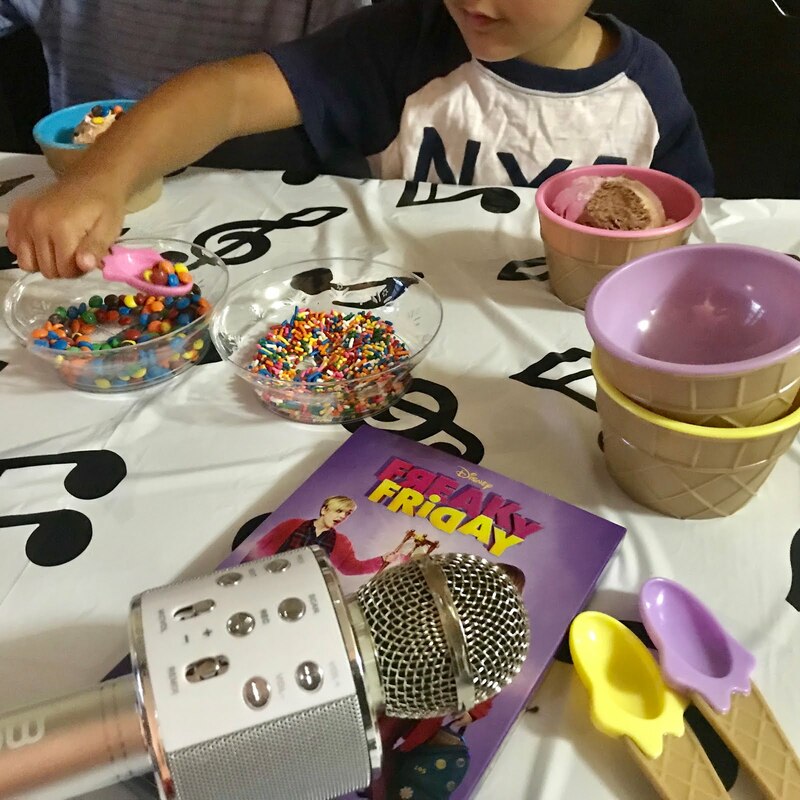 We then decided it would be an epic karaoke party with some yummy ice cream to celebrate the remake coming out on DVD on September 25th. A contemporary musical update of the classic comedic story, "Freaky Friday” is based on Disney Theatrical Productions' stage adaptation of the celebrated novel by Mary Rodgers. Sixteen-year-old Ellie Blake and her uber-organized mom Katherine, are constantly at odds about Ellie's messy room, sloppy clothes and seemingly careless attitude. Ellie really misses her dad who passed away a few years ago; she bickers with her younger brother and argues with Katherine who's getting ready to marry her fiancé, Mike – tomorrow. As mother and daughter quarrel, they accidentally break the treasured hourglass given to Ellie by her father and then, suddenly, they magically switch bodies. Now, Ellie and Katherine must trade places at work and at school, and, during one crazy day, they'll learn to understand and appreciate each other. It was such a great time singing all the songs with our Karaoke microphone! The boys are quite the performers so anything that has to do with music they are all about. It was such a fun time, but all that singing led to some well deserved ice cream sundaes that they topped with their favorite sweets! A great time if you ask me! Now my boys can totally agree that they would never ever want to trade places with me, but I sure would want to trade places with them any time! I mean who wouldn't want to be a child with no obligations instead. - Materials were sent to me for the exchange of a review, but all opinions are 100% honest. Latina Mommy/ Lifestyle Blogger: Colombian background. Gemini. Jace & Caleb's Mommy. Coffee & wine enthusiast. Sarcasm is my best attribute. IN LOVE with Jesus Christ. Open-minded.Hip Hop is my lifestyle. Shoe Addict -Im literally going to be the woman who lived in her shoes. Make up Hoarder at its best!. The little things in life make me happiest. Poetic Justice. Knowing Im loved & appreciated is my greatest joy. I am not an expert on parenting. I am just sharing my opinons and things that have worked for me & my family ! HotelT3 is out on DVD TOMORROW 10/9! © Copyright 2017. MommyGorjess. All Rights Reserved. Simple theme. Powered by Blogger.